A sack of large white butter beans at the market. Despite the name, butter beans are quite different from butter — they contain no fat and are rich in carbohydrates and fiber. Butter beans are also rich in protein, which may make them beneficial for inclusion in a vegetarian diet as a protein source. According to LIVESTRONG's food database MyPlate, each half cup serving of butter beans contains from 80 to 100 calories. If you base your daily calorie intake on the suggested level of 2,000 calories, then one serving of butter beans provides from four to five percent of your daily intake. The calorie expenditure information at MayoClinic.com indicates you could burn off those calories through about half an hour of walking at a two mile per hour pace. 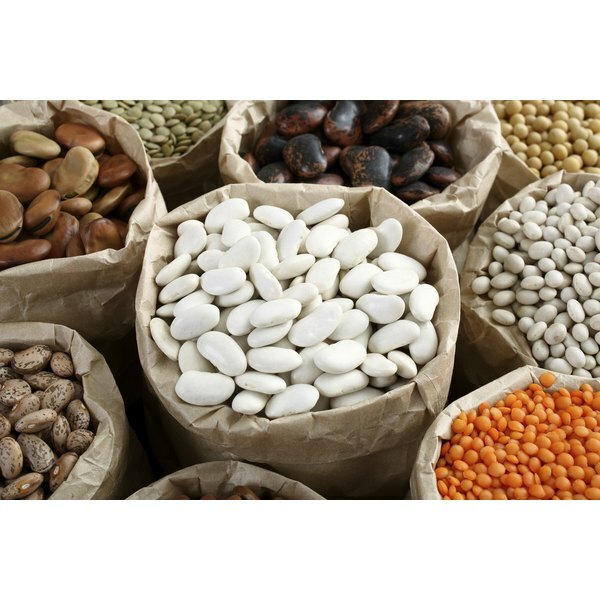 MyPlate notes that the main source of calories in butter beans is the carbohydrates. Each half cup serving contains from 18 to 19 grams of carbohydrates. Of these carbohydrates, four to five grams come from fiber. The National Library of Medicine and National Institutes of Health explain that fiber is a vital nutrient that aids in digestion and keeps you feeling full. Each half cup serving of butter beans provides from five to seven grams of protein, according to MyPlate. Protein is essential for supporting the structure of your body's tissues. Butter beans do not contain fat, according to the nutrition information on MyPlate. However, cooking beans with butter, oil or other sauces may add fat, so check nutrition labels when possible.